WHO: Anyone of any age who pays the $5 submission fee, sponsorships available! WHAT: A chance to show your work in the beautiful Padnos Gallery. WHY: To bring the creative community together! HOW: Design, decorate, build or alter a 12”x12” piece of cardboard. HOW MUCH: $5.00 per 12”x12” cardboard work- make as many as you wish to display, no limits in number of artwork to display. Art will be for sale at $50 each with 50% going to the Arts Council as a fundraiser for art supplies and 50% to the artist. 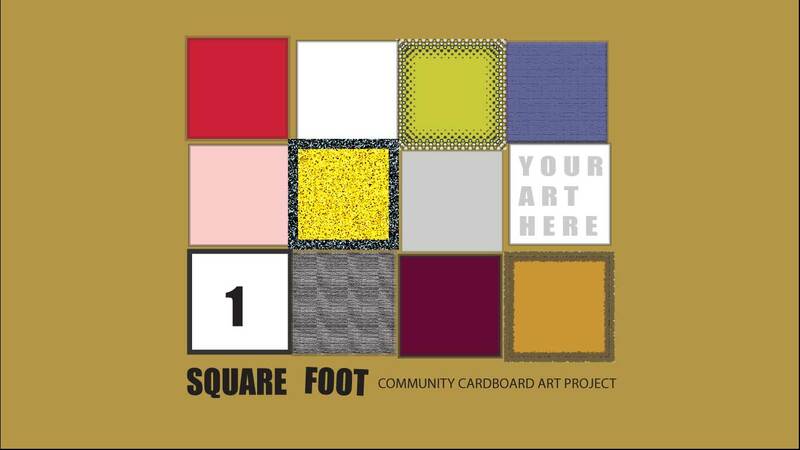 GUIDELINES: Between January 3rd and 10th during normal business hours bring in your completed 12”x12” square of card- board to the Arts Council. You supply the cardboard. The cardboard can be altered in any way but must be able to be hung on the walls with T-pins and/or rolled painters tape. If it falls off the wall it will not be hung. Make sure all pieces are secured well if the work has a 3D component. If you want your artwork returned, please include your printed full name, telephone and email address on the back. If you want, include a title and your name on the front of the piece. We will not be labeling the works individually. Please consider this is a family friendly event, and artwork deemed inappropriate for families will not be accepted. Anyone of any age can show in our beautiful Padnos Gallery with their 12’x12” square of painted, drawn on, carved, glued or in any way altered piece of cardboard. There will be a public vote during the exhibition and of best in show with a $100 award given at the end. Classrooms, clubs, families and organizations are encouraged! We want them all. You do not have to be a professional artist. We want everyone to show us their creative side to make one large collective work to display in the gallery. fee of $50. Businesses that have workers participate without use of the logo/name will be treated as an individual submission for $5 each piece. Make sure the cardboard is cut to 12”x12” and the work stays within the cardboard square. Height is acceptable, if lightweight and able to be hung with tape and t-pins. Make sure the work is dry, sturdy and in one piece. Nothing should be falling off. If it is falling apart we cannot hang it. We will be hanging with T-pins. $5.00 cash or check is accepted at the time of delivery for each 12”x12” artwork. Multiple works are accepted and encouraged!